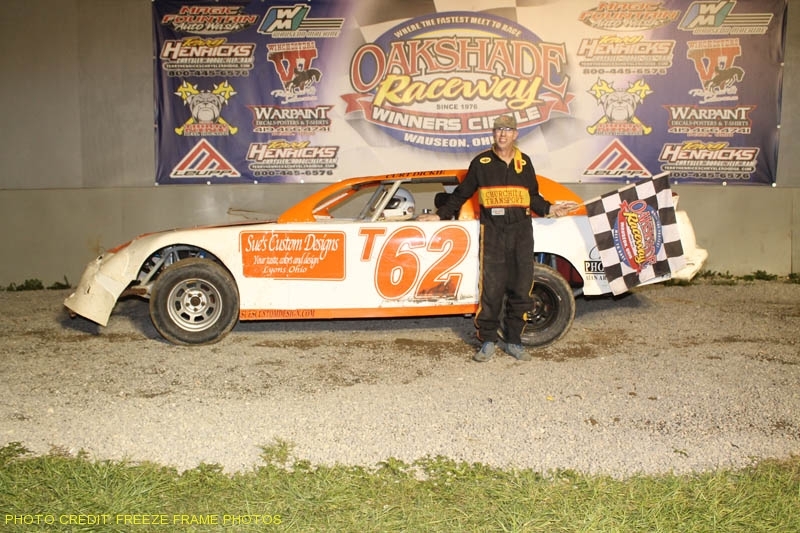 Aaron Scott lead all 40 laps of the $3,000 to win American Late Model Series Feature at Oakshade Raceway Saturday at the Butch Wildermuth Memorial. Aaron Scott started on the pole and began to pull away with the lead from Rusty Schlenk and Rody Schroyer early in the race. Only one caution flag flew during the Butch Wildermuth Memorial ALMS Feature. That occurred on lap four when Josh Steinacker backed his late model into the outside retaining wall off turn four. With Scott continuing to lead, Casey Noonan worked his way toward the front. Noonan passed Schroyer for third on lap five and by lap eight he had taken second away from Schlenk. Noonan began to close in on race leader Aaron Scott while working through lapped traffic. At one point Noonan had caught Scott, but Scott negotiated the heavy lapped traffic more successfully than Noonan and began to pull away in the closing laps. Scott went on to pick up the victory and the check for $3,000. He also received the Butch Wildermuth Memorial Trophy sponsored by Integrity Automotive Group in Defiance, OH. Casey Noonan finished second with Rusty Schlenk, Wayne Maffett Jr. and Rick Delong filling out the rest of the top five finishers. Rich Noonan took command of the Sportsman feature at the start and began to pull away from second place Chris Keller early. Once again there was only one caution for Ron Shultz who spun in turn four on lap four. With Rich Noonan continuing to lead, Rusty Schlenk took second away from Keller and one lap later took the lead from Noonan. Mike Jessen started seventh and by lap nine had worked his way up to second and was closing in on Schlenk. Schlenk, who had been running the high line, switched racing grooves and began to run down low in the turns and once again began to pull away from Jessen. Schlenk went on to pick up his second Sportsman feature win pulling double duty in both the Late Model and Sportsman divisions. Jessen finished second followed by Josh Steinacker (another driver pulling double duty), Rich Noonan and Brian Fisher. The Bomber A Main turned out to one of the most exciting features of the night. The action started early when Todd Silvey lost control going into turn three bringing out he yellow on the first lap. Once the green flag flew again, Joe Smith, Danny Hogrefe and Josh Montague found themselves battling three abreast for the lead. The three drivers traded the lead several times as Chuck Leininger and Dan Bleikamp joined the fray. Leininger made it four wide to eventually take the lead. Todd Silvey once again had troubles and spun in turn four with one lap to go. Josh Montague was collected in the incident bringing out the yellow flag and setting up a one lap shoot out. Chuck Leininger, Dan Dippman and Jim Scout went three wide battling for the lead coming off of turn four on the final lap. Chuck Leininger managed to hold off the challenge to win the Bomber A Main. Dan Dippman and Jim Scout finished a close second and third respectively. Jake Rendel finished fourth with Dan Bleikamp settling for fifth. Craig Dippman led flag to flag in the Bomber B Main. Several minor cautions slowed the event. With Dippman continuing to lead, Kevin Hanford and Shane Stuckey put on a heated battle for the second position. The two drivers swapped positions several times. In the end Kevin Hanford finished ahead of Shane Stuckey for the second position behind Craig Dippman. Dave Sibberson finished fourth and B.J. Gregory was fifth. Nick Fenner was the early race leader in the Bomber C Main until Randy Murday took the lead from him on lap five. Matt Shipley followed the 79 car of Murday dropping Fenner back to third. Shipley, last weeks Bomber A Main winner, eventually got by Murday and went on to claim the Bomber C victory. John Gamber finished third behind second place Randy Murday. Nick Fenner fell back to finish fourth just ahead of Wade Rick. Saturday, July 2 is Howard Miller Memorial night featuring UMP Late Models and the Sportsman and Bomber divisions.